DW Life > d i v e r s i t y w o m a n . c o m W i n t e r 2 0 1 7 D I V E R S I T Y W O M A N 47 download Honey, a browser extension that automati- cally searches for coupon codes and provides a list of offers at checkout. Remember to use coupon codes strategically. For example, if you're visiting a retailer that allows the use of more than one code, and you have a 25 percent discount and a $10 off code, use the percentage first so you'll get the discount on the full amount of your purchase. Ask for a discount Can't find a coupon code? Woroch advises opening a live chat because customer service reps will frequently offer a one-time discount or waive ship- ping if you ask what they can do to help you make your purchase. You can also try calling a customer service line and speaking to a live representative who can also offer discount codes and one-time deals. Retailers will often match com- petitors' prices. Be social "Friend" retailers on Facebook and check their Twitter page before making any purchases, suggests online shopping expert Michelle Madhok, publisher of SheFinds.com. Sign up for email news- letters, too. "Retailers frequently give subscribers early access to sales and ad- ditional discounts," she says. Group deal sites like LivingSocial and Groupon can mean getting great buys on everything from travel to dining out to fashion. Sign up for price alerts Planning to make a purchase at a specific site? Visit GiftCardGranny.com or Raise.com first to see if you can score a gift card at a reduced price, says Madhok. Recent deals include nearly 17 per- cent off an A.C. Moore gift card and 13 percent off a T.J. Maxx card. Shop with the little guys Sites like Amazon and Walmart are still the biggies when it comes to online shopping—and even relative newcomer Jet.com is grabbing a piece of sales—but don't ignore smaller sites. Community seller sites like Etsy.com and OpenSky. com can offer unique items and great deals on stuff you won't find elsewhere. But pricing depends on competition, says DeBlasi. "If you see similar items from different sellers, click 'ask a ques- tion' and see if the seller will come down in price." But always check the shipping costs on either site, since sellers can be located almost anywhere. Get cash back "Take advantage of shopping websites like Ebates.com or Splender.com that allow you to earn cash back on online purchases on top of retailer discounts," advises Madhok. Recent cash back offers include 8 percent cash back at Sephora and 6 percent cash back at JC Penney. Get your receipts emailed to you. Paribus is an up-and-coming online shopping tool that reviews re- ceipts in your in-box and requests price adjustments on your behalf when prices drop on items you've already purchased, says Woroch. "Paribus takes 25 percent of whatever you get, but considering you wouldn't take the time to do this for yourself, you still come out ahead!" Slice will also alert you when a price drops and help you get money back. Sign up for price alerts Register at sites like Price!pinx or Shop- Style.com to be notified when items you want to buy drop in price, suggests Madhok. "Or create a Pinterest board of items you want to buy, and Pinterest will email you when the price drops." Pricedro- palert.com, MyAlerts, and dealalerter.com will also let you know when prices go down on items you want. Visit discounters Sites like Over- stock.com and 6pm.com are great places to nab a deal on closeout items, refurbished electronics, and even brand-name items from past sea- sons, says Madhok. "And eBay.com/deals offers a huge discount on limited-quantity one-day deals." 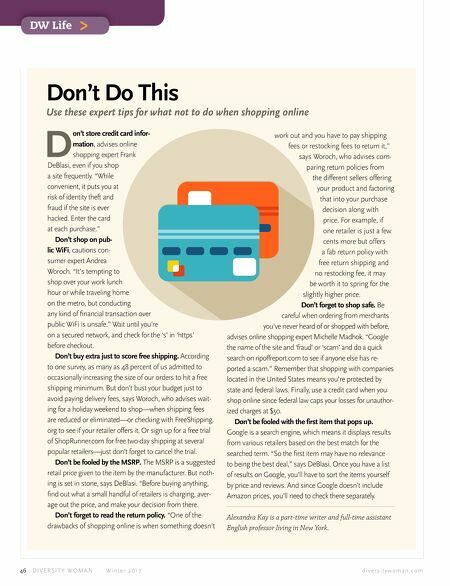 Before hitting mainstream retailer websites for a purchase, check in with these sites to see what they have to offer. Blinq. com works with retailers to offer discounts of up to 70 percent on items that have been opened and returned to stores. 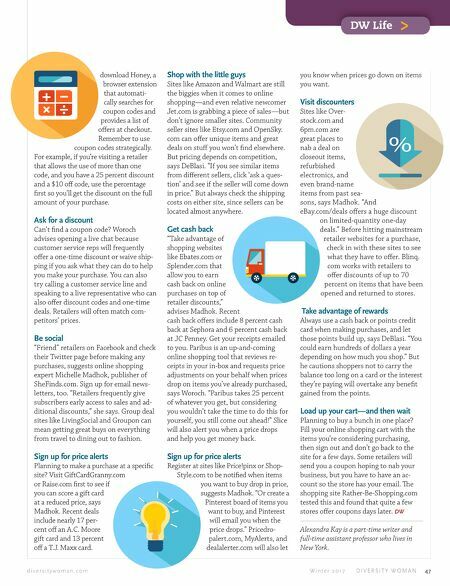 Take advantage of rewards Always use a cash back or points credit card when making purchases, and let those points build up, says DeBlasi. "You could earn hundreds of dollars a year depending on how much you shop." But he cautions shoppers not to carry the balance too long on a card or the interest they're paying will overtake any benefit gained from the points. Load up your cart—and then wait Planning to buy a bunch in one place? Fill your online shopping cart with the items you're considering purchasing, then sign out and don't go back to the site for a few days. Some retailers will send you a coupon hoping to nab your business, but you have to have an ac- count so the store has your email. e shopping site Rather-Be-Shopping.com tested this and found that quite a few stores offer coupons days later. DW Alexandra Kay is a part-time writer and full-time assistant professor who lives in New York.